People may not remember now, but before Tiger Woods, Nike was only moderately successful in penetrating the golf market. Here we tried to capture the emotion of competition at the highest levels, using Nike golfer Curtis Strange. Nike introduced Nike Air cushioning technology around 1980, but the technology had not been perfected. But by 1987 a new generation of Nike Air revolutionized the way athletic shoes were marketed and perceived. This ad was targeted specifically at the running market. Later campaigns would find greater traction by combining technology with fashion. In the pre-internet era, Nike liked to make a big splash in new product introductions. 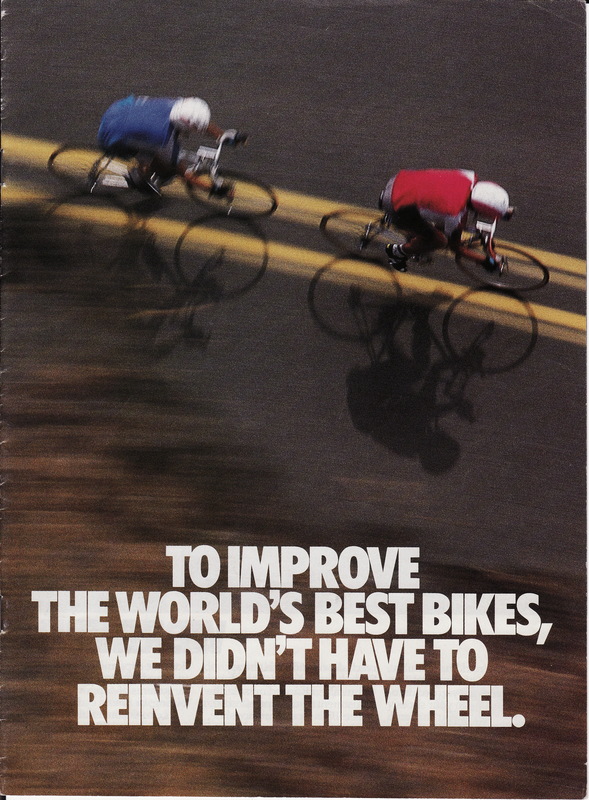 Here is the cover and first spread of a 12-page booklet that was inserted into bicycling magazines. Know your brand’s most basic values and remain true to them. Nike’s values include competitive drive and technical innovation. Next pay close attention to visual brand identity elements such as layout style, use of logo and typography. By staying true to the brand values and visual brand identity, messages for different products and services can capture the same voice, thereby amplifying each message.